"If you have the desire to be a doer of the Word and not just a Hearer...I encourage you to step out in faith and try the "In The Box Ministry". IT WILL CHANGE YOUR LIFE!" I have been part of the Inside The Box Fair Ministry since it began four years ago and I have to say it is one powerful ministry! 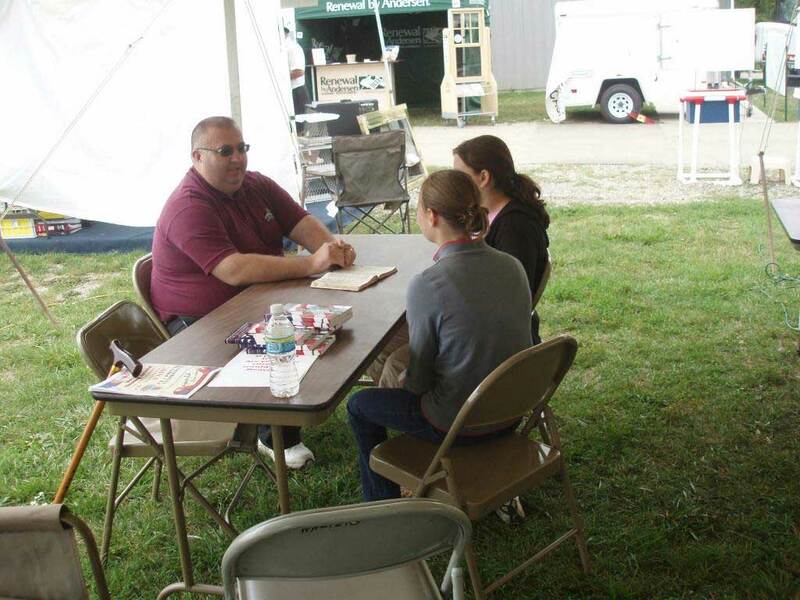 Even though I work a world-wide missionary evangelistic ministry I have found there is something extra special about working the fairs every summer. The one-on-one, or two, or three, or...you get the idea is so very electric as the Holy Spirit takes hold of each and every witnessing conversation inside that Gospel tent. There are so many special memories I have after four years of fairs, but one story in particular holds a very warm place in my heart. 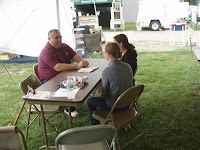 In the second year First General Baptist Church was at the Oakland County 4-H Country Fair I had the opportunity to lead two members of the Our Lady of Lakes football team to the Lord. As always that in itself was a blessing, but an hour or so later these two young men began leading their friends and teammates back so they could be led to Christ. This then began a huge domino effect as more and more of the Our Lady of Lakes football team began arriving at the tent to receive to Gospel of Jesus Christ. By the end of the night I had led the entire team to our Lord Jesus Christ. I definitely had a skip to my step! Frederick County Fair-day 5- 36 saved-4 rededicated!!! !The Holy Spirit was powerful tonight... God Bless you Pastor Jeff and Pastor Tom for your vision and your help!!! As blessed as those souls are that have been saved I and many others are equally blessed knowing know that we CAN step out of our comfort zone. And little did I know that was were I would find the JOY!!! PRAISE GOD!!!! 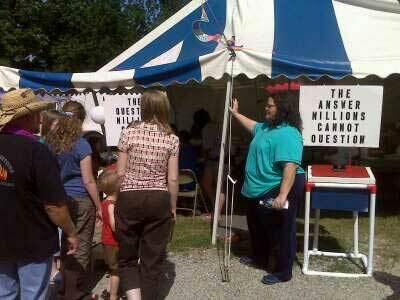 Day 4- Virginia Fair: 42 salvations. We will be on the road Friday traveling home to Michigan, but we leave In the Box in well-equipped hands. The people of New Hope Baptist have been spirit-filled all week and are doing an amazing job. Pray for them as they finish out the Fair-may God richly bless their faithfulness. Pray for us as we travel home. Let me introduce myself...I thought my name was Debbie but I found it to be Mrs.Doubting Thomas. When I first heard of the "In The Box" Ministry. I heard about several hundred people giving their life to the Lord in one week at a fair which is not your typical place you could imagine people taking time out to even think about their salvation. I have spent 3 days in the tent at the Frederick County Fair and I want you to know all doubt is gone. I am humbled by the way God can use an ordinary person like me to do extraordinary things for Him. I had never lead anyone to give their life to the Lord until Monday night. Now I can tell you that I cannot count on all of my fingers and toes how many people the Holy Spirit has saved by speaking through me. I would like to share one example with you now. Last night at 10 pm the Lord had 3 young people come to my tent. I proceeded to share the Romans Road Plan of Salvation with them. As I shared I could see by looking into their eyes that the Holy Spirit was convicting them. I then ask the question: Would you like to ask Jesus into your heart and save you from eternity in Hell? The spiritual battle then began. The girl said no and seemed a little uneasy. She told me that if she was going to do that she would do it in private. I then ask one of the young men and he said "no, I agree with her". I then ask the final young man and he looked at them and said "I want to do this" and he looked back towards me. The other two immediately got up and left the tent as he and I prayed the sinners prayer. WOW WHAT A FEELING!!!! I can't describe to you what it is like when someone sincerely wants to ask Jesus into their heart and you are the one leading them there!!!!! He could easily have went with the group and said no just because they did, and I have sadly seen that happen this week. But the Spirit was speaking to his heart and he made the best decision he will ever make for his life!!!!! !PRAISE THE LORD!!! So let me introduce myself again. My name is Debbie and I now know that Jesus can use me to populate His heaven....If you have the desire to be a doer of the Word and not just a Hearer...I encourage you to step out in faith and try the "In The Box Ministry". IT WILL CHANGE YOUR LIFE!!!!!! We have have a wonderful week here in Winchester Va. As of now we have seen 143 come to know the saving grace of Jesus Christ and there is still three days left of this fair, Praise God! We want to thank Alan and Debbie Knotts for putting up with us this week and the people of the New Hope Baptist Church and In The Garden Mission for having a burden for lost souls. 7/27/2011 from Allen Knotts, Sr.
Frederick Co Fair, VA:DAY ONE TOTAL: 45 Salvations! Hallelujah! Some folks here have not led anyone to Christ before. What a blessing to be part of this discipling, they are so excited. We have also made some wonderful new friends in Christ. This is a smaller fair than ours in Michigan, but the LORD of the harvest is faithful, we know the fields are white! Continue prayers! CJ of our teen department led his first of many people to the Lord yesterday and is coming back today. Day One Final Report: Satan was truly at work: we had an irate mother try to have us shut down because the notion of an eternal hell was brought up to her children. The Devil also had his army of atheists out in force to harass and belittle our attempts to tell people about Christ. Yet with every challenge Satan threw at us, our God proved greater. I am pleased to report that the first day total of souls turned from Hell and brought to the saving grace of Christ was 120, topping our previous one day total by three. We had a man come by tonight who said he stopped in the tent last year. He went home and told his wife that they needed to start going to church. Since then his wife AND his son have been saved!